There are sophisticated, cost-effective tools out there to help you build your campaign quickly and easily. Lastly, to ensure its success, there are some peripheral tasks you’ll need to do apart from just building it. In this post, we’ll cover all of the things you’ll need to do in order to run a successful contest or giveaway, and provide loads of resources along the way. To collect user-generated content (pictures, videos, stories, etc.) that can be used for further marketing. And that’s just a few ideas to get your brain juices flowing. Organic reach has really tanked. Not just on Facebook, but Instagram as well. What this means is, when you post something on your Page, as few a 2% of your followers may see it. You don’t own your social media audience. If Facebook disabled your account tomorrow, all of that work you put into building your following will be gone forever. What can you actually do with a Fan or a Follower? With paid ads as the exception, there isn’t any usable data to glean from that list of people that clicked “Like.” You don’t have their email address, or any other data readily available to help you convert them into customers. The participants arrive at the contest. If they want to vote on an entry, they click a button and the gallery of entries appear. They can vote on one, and share the entry to help raise more votes. 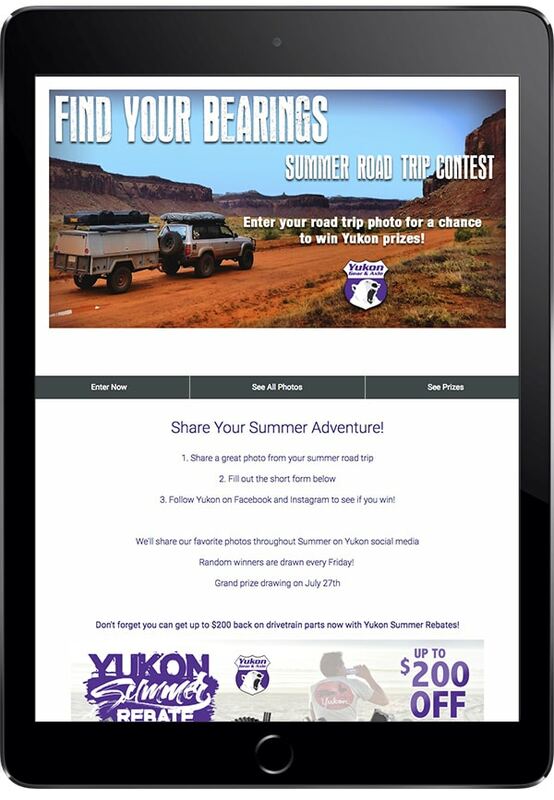 But if they want to submit an entry, they will click “submit an entry,” upload a photo, and then a share prompt will appear so they can share their entry to social media and raise votes. 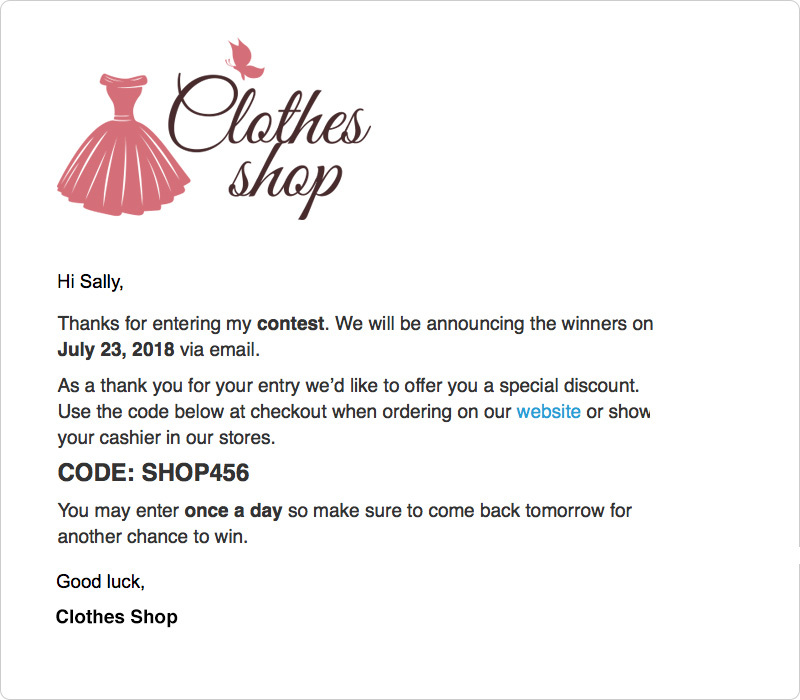 Whether they submit an entry or vote, they’ll see a pop-up with some “Thanks!” messaging and a coupon code. 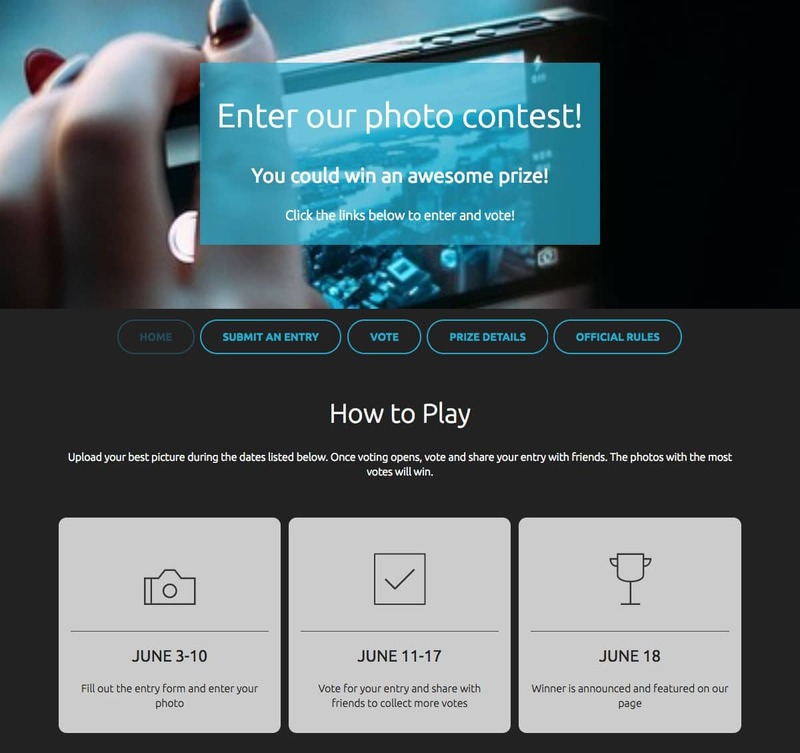 The flow-through in which your participants arrive at the campaign, interact with the campaign, and recieve any follow-up communication about your contest or giveaway will tie in with your goal. In fact, coming up with the UX will be the way in which you achieve your goal. If you’re looking to build your email list, part of your UX will be to trigger an email autoresponder once the participant has entered the entry form. In this autoresponder, you can include a double opt-in which is a best-practice for building solid email lists. Learn more about the importance of double opt-ins here. If you’re not familiar with everything that’s possible in this sophisticated era of contest and giveaway building, check out some of these campaign examples to help you understand what’s possible. The prize is very important, not just because it needs to provide the appropriate “draw,” but also because it will help you weed out those who will potentially become a customer of your business vs. those who will participate in your giveaway and run off like a bandit in the night. Pick a prize that’s relevant to your business. For example, if you’re a nail technician, giving away a deluxe mani/pedi will attract people who are in or near your zip code and interested in having their nails done, therefore, qualifying your participants as potential future customers. Need some prize ideas? Look no further than this handy list. This one is very important. Grab your colleagues, make some coffee, and get comfy around the conference table. Brainstorm all of the possible things that could go “wrong” when running your contest. What if a 18-year-old wins your prize, and it happens to be a case of wine? Or what if a 16-year-old wins your two-night hotel stay? You can prevent mishaps like this simply by writing restrictions into your rules. Once you’ve brainstormed all of the “worst case scenarios” you’re ready to write your rules, disclaimers and terms and conditions accordingly. For example, in a voting contest, what would you do if a participant collects 20,000 votes in the span of an hour? It’s happened. Although contest builders like ShortStack offer plenty of ways to combat cheating, there are “voting groups” that collectively cast votes to help each other win contests. Crazy, right? In an instance like this, implement some sort of disclaimer that allows you to disqualify anyone suspected of cheating. Or that, in the event of a cheater, have the winner selected by some other means, i.e., the winner can be selected from the top 10 vote-getters by a panel of judges. To help you with this important task, we’ve put together this Rules template with the boilerplate stuff already included. Whichever contest builder you’re working with, chances are it will include some tools to help you design the look and feel of it. Regardless of the sophistication of the tools provided, you’ll want to have some professionally designed art to include. It’s incredibly important that your contest or giveaway reflects your company’s branding. In this era of data breaches and heightened data security, no one’s going to submit their email address to a campaign that doesn’t look 100% legit. If you’ve made it to this point with a goal, a beautifully built campaign, some ironclad rules, and prize that’s gonna get you loads of entries, hit the publish button! But listen closely… You hear that? Publishing the campaign to the web or to Facebook, doesn’t do anything but make your campaign accessible to participants. You’ll need to shout about it from the mountain tops and everywhere else you can think of to help you get the word out. Not sure where to start? Here’s a great resource with 40 ways to promote your campaign. Your promotion plan should go beyond announcing the campaign’s kick off. Make sure you’re also taking advantage of the promotion opportunities that happen throughout and after your campaign is over. Announce status updates, promote entries (in a voting contest) and of course, let everyone know when a winner has been chosen. While you have the ear of your audience, keep the momentum going by announcing your next contest or giveaway and start the process over again. The best part about running a contest or giveaway is all the juicy data you collect from your audience. Did you capture email addresses? Birthdays? Or give out coupon codes? Just like your UX, the follow-up plan is something that can be thought of in advance because it will tie in with your goal. Take the steps to set up the necessary elements that will let you capitalize on this valuable info – whether that means setting up an email to go out on birthdays, or tracking how many of those coupon codes were redeemed. One might say, after the fun and fanfare of the contest is over, is when the real work to convert customers begins. 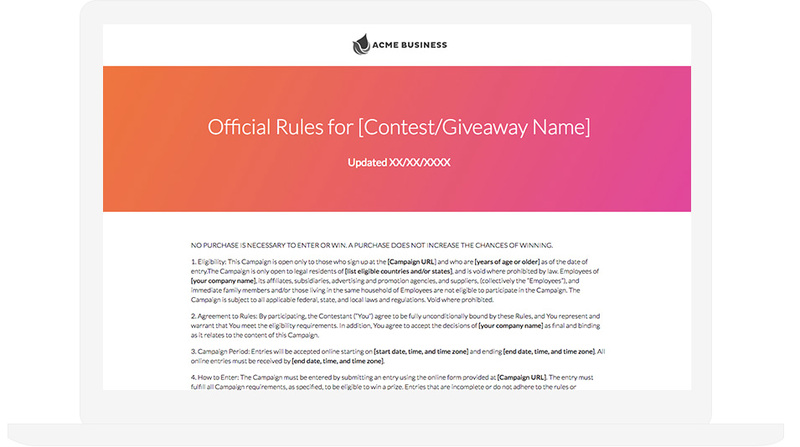 Understanding that there’s more to running a contest or giveaway than throwing an entry form on a landing page, or a “Like this to enter” post on Facebook, will help you get the most from this effective marketing approach. Making your contest or giveaway one component of a comprehensive strategy – starting with a goal and implementing a follow-up plan – will really help you kick those sales into high gear.